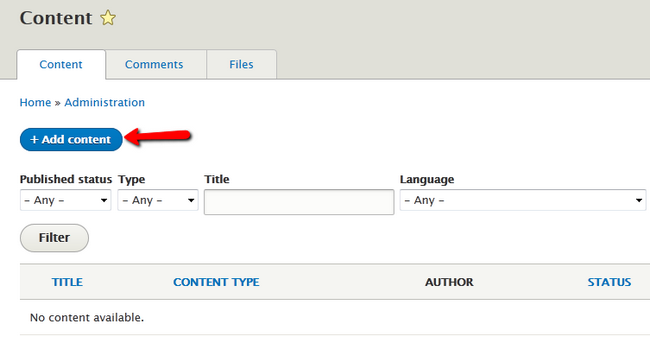 In this tutorial, we will show you how to create custom static pages on your Drupal 8 based website. Please access the admin area of your website and navigate to Manage>Content. Next, please click on the +Add content button. You will be able to select between two types of content. Choose the Basic page option. Now you will be able to create a new static page. Choose a Title and write the content inside the Body field. From the menu on the right expand the Menu Settings section and checkmark the Provide a menu link box. This will open additional fields for you to configure. 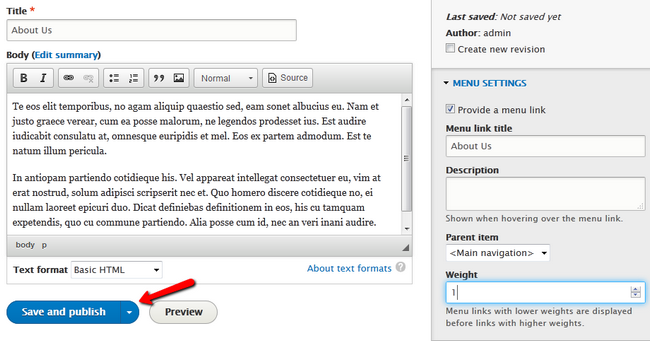 In the menu link title add the label you want the menu to have when viewed from within your website. You can also add a short Description that will be shown when a user hovers over the menu with his mouse. For Weight we will use a value of 1 so the page menu will be shown after the Home menu. When you are done, click on the Preview button if you wish to preview the page or the Save and publish button to directly publish the page to your website. Here you can see that our new page has been created, and when clicked on it will show the content we have added in it. Congratulations, you now know how to create static pages for your website.